South Africa has by far the most developed and modern infrastructure on the sub-continent. But it is steeped in long and turbulent history. The road to becoming one free nation was much longer and seldom less turbulent than the political turmoil of the last half century. The southern shores of the African continent formed a natural boundary to the overpowering Bantu migration out of West Africa. They also formed the stepping stone for European settlement and colonisation of the entire subcontinent, the foothold for early explorers, hunters and traders seeking to penetrate the interior; the stage for great power struggles, wars, treaties and barters between and among African and European Empires. 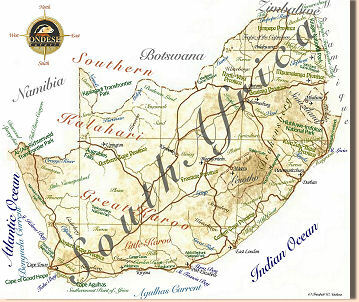 Place-names and the names of events and individuals ring with history: The Cape of Good Hope, the Voortrekkers, Shaka Zulu, Blood River, the Anglo-Boer wars, apartheid, Soweto, Nelson Mandela. Silent backdrop to all was and is the vast African landscape. And in modern South Africa, vibrant, diverse and effervescent, one can still find large stretches of wilderness beyond picturesque, cultivated countrysides and the monuments of history.